Anyone that said Vivaldi and Strauss couldn’t possibly be touring together in 2018 will soon be eating their words. The difference of course being that the musicians on The Guitar Collective 2018 run are very much alive - Nita Strauss even having descended from Johan II himself amongst the other classical musicians that continued the family name, going as far as to recreate some of that same baroque majesty on her recent Controlled Chaos solo debut. “One of the things we wanted to do on this tour was a big Strauss and Vivaldi mash-up, but unfortunately because of schedules we couldn’t pull it off,” says the New Jersey native. If there’s one thing that works as Vivaldi’s forte, it’s versatility. Being a progressive artist has led to him absorbing influences from a wider net than most, as well as writing music that follows its own signature motif and narrative. Being more open-minded in his musical endeavours has also meant the guitarist can play with all kinds of other artists and their audiences, these experiences leading to him soaking in more flavours and spices. “The advantage there is I’ve toured with completely different bands and learn from people of all walks of life and genres,” he reflects. “Generally I would say each style has its own blueprint as far as arrangement and how aggressive they play. “We’re just about to announce my signature coming out at 2019 Winter NAMM, so I’m very excited,” he enthuses. “It has DiMarzio pickups, which we might be working on for something that comes out in the future. “The foundation of my approach is legato. I look at it like this thick Redwood tree that has all these other different techniques branching out of it. The most important thing for any guitarist is putting together all the little pieces from your influences. “For instance, I feel like I’m the lovechild of Kurt Cobain, Kirk Hammett, Alex Skolnick, Eric Johnson and Yngwie Malmsteen. You put that in a stew, stir it up and boom... I will come right out of it. “If people gravitate towards what I do, it’s mainly in the fluidity of my legato. And tapping, which is essentially extended legato. My sweep-picking is half-picked and half-legato. There’s a certain type of smooth, silky bluesiness that comes from legato. “That’s the start of being able to write a good song. Here’s the thing: if you have a good idea of song structures and melodic tension, you can captivate people. But if you can’t write a riff or a song, you can play guitar until you are blue in the face and it will be for nothing. Honestly, the only way to capture the ear of an audience is with a good song. “So I think it’s important to write pieces with beautiful harmonies and progressions but also remember to phrase in a way that’s elegant and does the song justice. In this day and age, everyone can play pretty well. The average guitarist doesn’t impress anymore; there are a million other players out there. “You hear the word phrasing a lot around guitar players. Everyone’s always like, ‘Check out this phrasing, it’s so good!’ but I feel like people sometimes don’t really have the same idea of what phrasing means. I break up guitar into three aspects: first is the intervals, so you can play three simple notes in different orders, like E/A/G, E/G/A, G/A/E, G/E/A, A/G/E, A/E/G. “The second element is the rhythm; it’s the beat you play those notes. The final pillar is the phrasing; it’s the finesse behind the fingers, the type of vibrato, whether you slide into notes, what techniques you use, from the whammy bar to harmonics… all those little things that make each guitarist different. “Trends come and go, but the great players remain instantly identifiable. With Malmsteen, you know it’s him straight away, same with Vai. That’s what phrasing means to me: the identity you create through those little touches. “I was going to say look good doing it, but figured this is probably a better answer, haha! Work out what it is you want to say, establish realistic goals for yourself and be honest. If you want to be the fastest player in the world, God bless you… do it! If you want to be as melodic as Satriani, do it. It is possible. “But do it in a way that works for you. Today’s players will be able to see everything on YouTube - you can see Plini doing his thing, me doing it my way. The knee-jerk reaction is to try everything, but when you try to grow 100 plants and give each one 1%, you might not necessarily grow anything. “This my last one, so I’m going to have to make it count! I might just go for a load of one-liners from what I’ve learned working in the music industry. Number one, the person you are influences how your art is perceived. Number two, be honest about strengths and weaknesses without judging. Number three, no bond is stronger than mutually hating the same person; never base a friendship on hate. “Have a website and make sure it’s great. The industry is small and words travels fast, mind your speech. Get over the fact not everyone will like you or your art. Finally, artists and creatives can be fickle; learn to avoid conflict with integrity and passion. 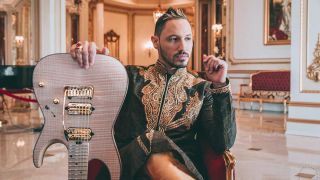 The Guitar Collective 2018 tour the USA starting on 19 November - head over to Angel Vivaldi's website for full dates.